Carmaker Jaguar Land Rover has teamed up with virtual band Gorillaz to find 5,000 staff to enhance its expertise in autonomous and electric technology. The firm says it will use a two-stage recruitment challenge, to be found on the Gorillaz mixed reality app, as an "innovative recruitment tool". The first part involves virtually assembling the Jaguar I-PACE Concept, an all-electric five-seater sports car. The second part involves a series of code breaking puzzles. "As the automotive industry transforms over the next decade, fuelled by software innovation, we have to attract the best talent and that requires a radical rethink of how we recruit," said Alex Heslop, head of electrical engineering at the car firm. "Here we've found an engaging way to recruit a diverse talent pool in software systems, cyber systems, app development and graphics performance. It will be the first of its kind." 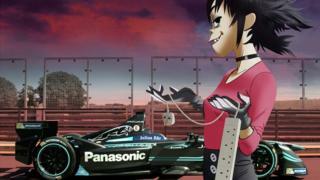 Gorrilaz female guitarist, Noodle, is already Jaguar's Formula E Racing's ambassador. The firm said it would hire 1,000 electronic and software engineers and 4,000 workers across other sectors, including manufacturing. Most of the jobs will be based in the UK, with recruitment taking place over the coming year. The firm has five sites in the West Midlands, and one on Merseyside. The company will build the I-PACE, in Austria. But it has indicated it would like to make such models in the UK if conditions such as support from government are met. Jaguar Land Rover has indicated half of all new models will be available in an electric version by the end of the decade, necessitating new skills among its staff.